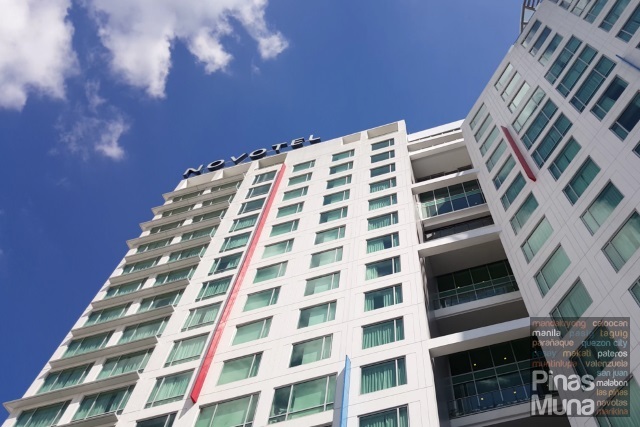 Novotel Manila Araneta Center is a first class mid-scale hotel located at the Araneta Center in Quezon City, near retail and dining outlets, BPO offices, as well as major thoroughfares and transport hubs. It features 401 contemporary and stylish guestrooms and suites which cater to the needs of international and local business and leisure travelers. Novotel is a French hotel brand and is part of the AccorHotels Group. As of December 2015, Novotel has a total of 428 hotels and is present in 61 countries. The first branch to open in the Philippines, Novotel Manila Araneta Center is owned by the Araneta Group of Companies and managed by the AccorHotels Group. You will Feel Welcome as soon as you step in Novotel Manila Araneta Center. 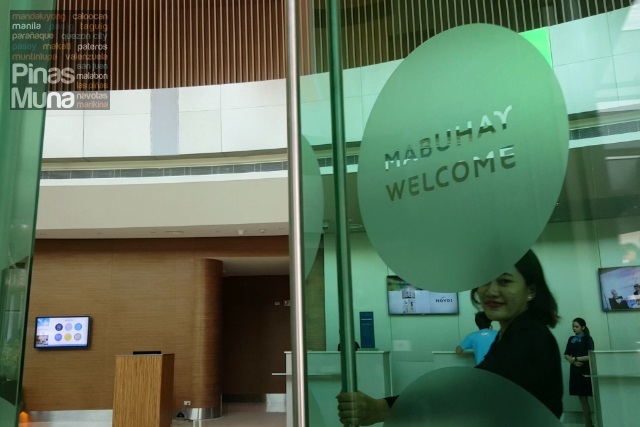 The door itself has a frosted design with an etched "Mabuhay" message to welcome guests. It is a standard in all Novotel branches around the world to etch the hotel doors with a bilingual "Welcome" greetings in English and in the local language. Consistent with the global people-centric philosophy of AccorHotels, the hotel's employees, with their innate warm Filipino hospitality, will ensure that you enjoy your stay at Novotel Manila Araneta Center. That's exactly how welcomed we felt right at the hotel's reception area. 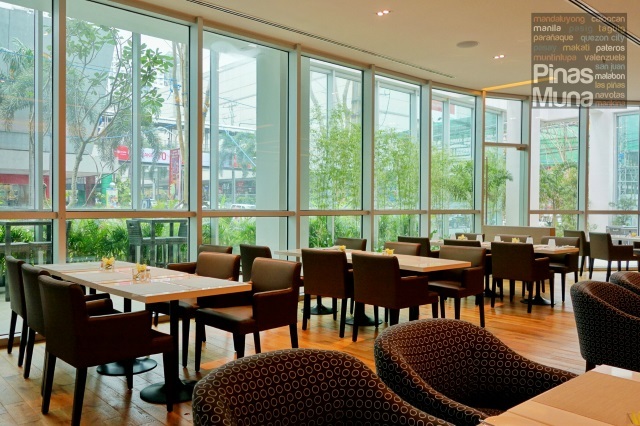 The contemporary design of the hotel's lobby also reflects the fresh vision of Novotel to hospitality. Today's business and leisure travelers are looking for wide open spaces, vibrant colors, hip yet classy designs. 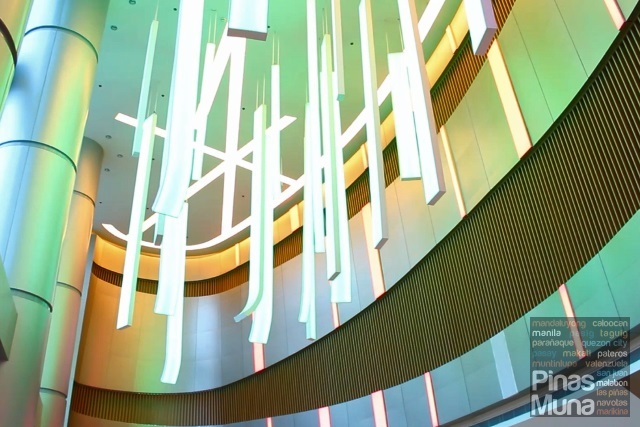 Highlight of the lobby are the state-of-the-art LED panels hanging from the high ceiling which constantly change colors, setting different moods in the area. 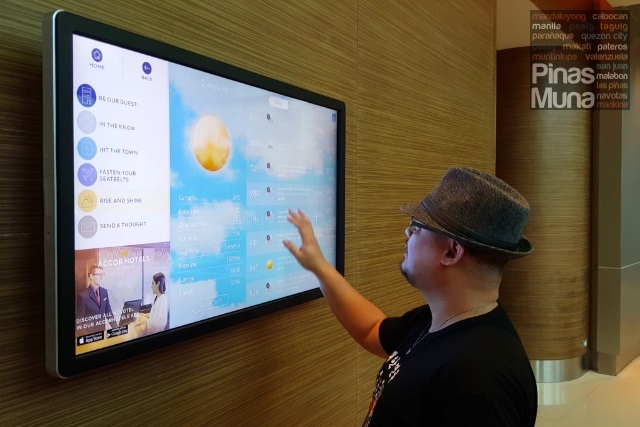 The lobby is also filled with tech features such as this large touch screen display where guests can know the basic information about the hotel, what can be found in the immediate neighborhood of the hotel, and to check the local weather. The friendly guest services representatives will be more than willing to assist you in planning your day-to-day itinerary as they have the know-how of the what-to-do's and what-to-see's. 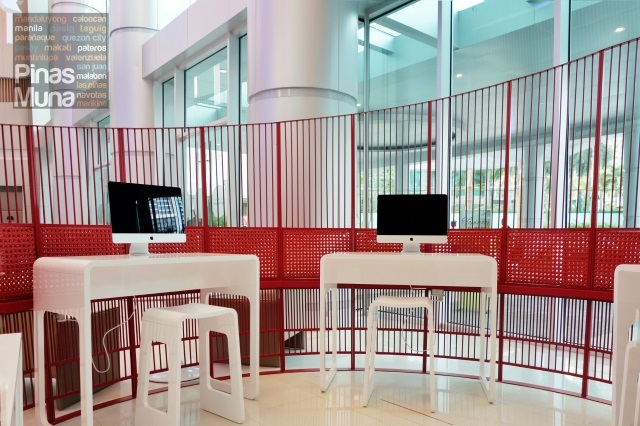 There are also a number of iMacs available at the lobby where guests can quickly surf the Internet, check emails or update their social media accounts. Checking-in was quick, uncomplicated and very efficient. 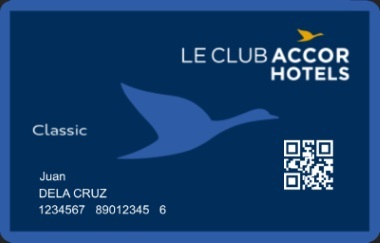 For a faster check-in, we recommend that you join Le Club AccorHotels. When booking using your membership number, your registration form will already be pre-filled with your personal information, which you just then need to verify upon check-in. What's even cooler is that there is a separate check-in counter for Le Club AccorHotels members. This membership is free of charge, and it gives you access to exclusive promos. You also accumulate points for every stay at all AccorHotel properties around the world. You can then redeem these points in exchange for your choice of reward, including overnight stays. By the way, there is a required incidental deposit of P3,000 per night which is refundable upon check-in. We already had two staycations at Novotel Manila Araneta Center, the first one was in October 2015 and the second one was in January 2016. During those two occasions, we stayed in a Superior Room which is measuring 29sqm. Superior Rooms can accommodate up to two adults and two children, and are available in two bed configurations, Superior King and Superior Twin. Highlight of the room is the Live N Dream bed which features a pocket spring mattress with a memory foam topper which gives perfect back support and comfort. The mattress is then covered with a 100% cotton fitted sheet with a threadcount of 150 per sq.cm. (about 400 per sq.in) which is very soft and gentle to the skin. Finally, the bed is covered with a high-tech duvet which is filled with hollow silicon fibers made of 100% recycled bottles. The duvet is encased in a cover made of 100% cotton of same quality as the fitted sheet. The bed also comes with four multi-comfort and multi-purpose pillows; two feathery-soft rectangular sleeping pillows for gentle neck support, and two Smart pillows which folds for back support and unfold for sleeping. Here is a short video about the Live N Dream bed experience at Novotel. The Live N Dream bed is the standard bed used in all Novotel properties around the world. This ensures that you have the same sleep experience whichever Novotel hotel you stay in. Other room amenities include a minibar, coffee and tea making facility, an in-room safe. 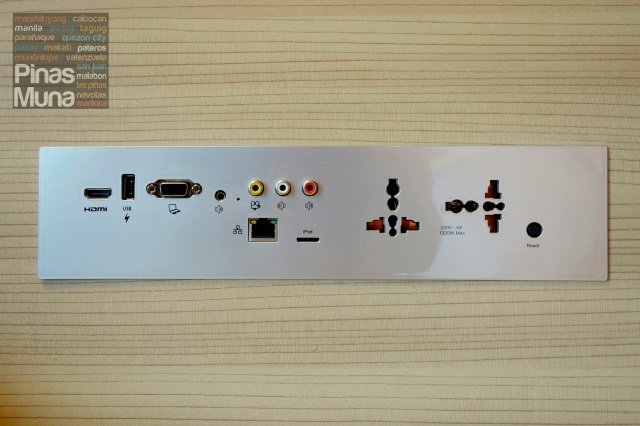 There's also an LCD TV with international and local cable channels. Free WiFi Internet connection is also available inside the bedroom. 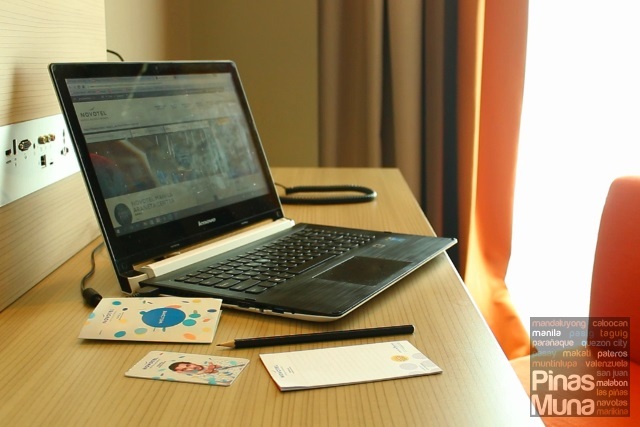 The bedroom has a spacious work table suitable for business travelers. There's also enough power outlets found around the room, including a multimedia panel where guests can access data through the LCD TV or plug in gadgets through universal power outlets. Separating the ensuite bathroom from the bedrooms is a glass wall electronically controlled blinds. With a press of a button, guests can lower the blinds for more privacy inside the bathroom. Another press of a button, guests can lift the blinds to continue watching the TV while having a shower. The bathroom has a single basin set up with modern tap fixtures. Next to the basin are the hair dryer and a heated mirror that doesn't get foggy after showers. The bathroom has a separate walk-in shower with a hand-shower and a rain-shower head installed to the ceiling. Water pressure was excellent and water temperature was easy to regulate. Hot water flows from the shower in only few seconds. There's a separate cubicle for the toilet which has its own exhaust fan. It is also installed with a bidet. In line with AccorHotels' sustainable development program, Planet 21, all toiletries are eco-friendly and are made with fair-trade cane sugar from Paraguay. Around the bathroom, and even in the bedroom, you will find notes on how you, as a guest can contribute to this sustainable development program, such as re-using towels and turning off the tap while brushing your teeth, both of which saves considerable amount of water. Other amenities available for guests are the outdoor swimming pools located on the sixth floor. The kids will surely enjoy the kiddie pool and the play ground located next to it. The In Balance Fitness Center is a fully equipped gym located on the sixth floor as well. While the hotel is on soft opening, there's a temporary gym located on the sixth floor. The In Balance Spa is also set to open this year. 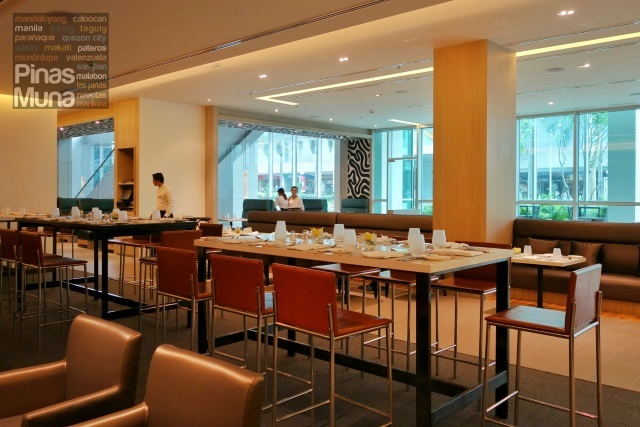 Novotel Manila Araneta Center has four F&B outlets, one of the which is the Gourmet Bar by Novotel. It is located at the ground floor next to the main lobby of the hotel. The restaurant features a modern Filipino chic design with earth-tone colors of browns and greens matched with beautiful curves from the floor to the chairs, to the tables to the ceiling. We have invited some friends for coffee and instead of going out to the nearby coffee shops, we invited them over at Gourmet Bar. They have a good selection of hot and cold espresso-based beverages. They also serve chilled and ice-blended fruit drinks. The seats are very comfortable which makes the place ideal for long meetings or catching-up with friends. It is open for a la carte lunch and dinners where guests can enjoy a variety of international and local dishes. The Gourmet Bar is also ideal for those who wish to unwind over beer, hard drinks and cocktails, served with their favorite tapas. Back in our room, we enjoyed most of our evenings watching cable TV while lazing in our bed. For midnight snack, there are a number of fastfood stores located near the hotel. You can opt to go and grab a take-away meal or dial food delivery. The hotel also has 24 hour in-room dining Room Service. We had long and uninterrupted sleep during our staycations at Novotel Manila Araneta Center. The sleep quality if one of the most important factors in staycations, and hotel stays in general. And our sleep experience at Novotel Manila Araneta Center is one of the main reasons why we consider it as our favorite staycation hotels in Metro Manila. Next of course is the breakfast. Overnight stay at Novotel Manila Araneta Center comes with buffet breakfast for two at Food Exchange, the hotel's all-day dining restaurant. 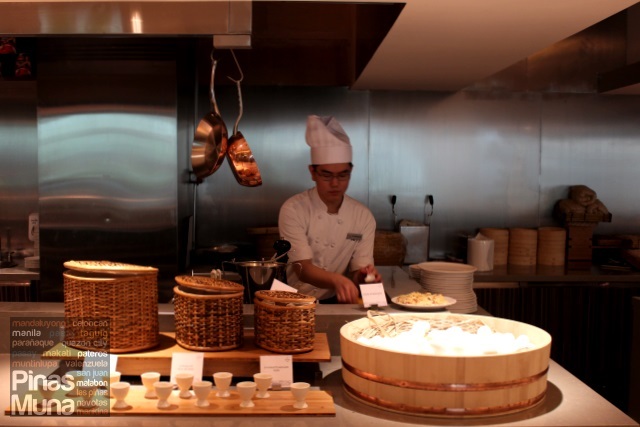 It serves international and local dishes prepared at the live cooking stations by the hotel's international team of chefs. 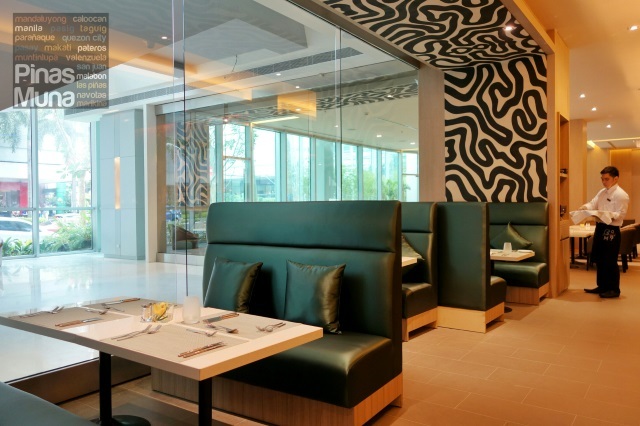 The restaurant also features bright and vibrant designs with colors and patterns that reflect youthful energy of the hotel. Food Exchange has one of the best food selections for breakfast. There's fresh fruits and salads to start with. There's an assortment of breads, jams, cheeses, cold cuts, as well as croissants and danishes. Breakfast pizza is also served. There's a noodle station and an omelet station. The Chinese station serves different varieties of steam and fried dimsum. The Indian station serves dosa and lassi, as well freshly brewed chai-spiced tea. For the mains, you can choose among Filipino, Indian, American and European dishes. We'll tell you more about the Buffet Breakfast at Food Exchange in a separate post. Here are some of the dishes we tried during our two staycations at Novotel Manila. Above are mostly Filipino dishes of adobo, bistek tagalog, garic rice and some bacon. Below are some of the sausages available from the buffet including Nuernburger and Bratwurst. Buffet breakfast is also available to walk-in guests at P888 nett per person. 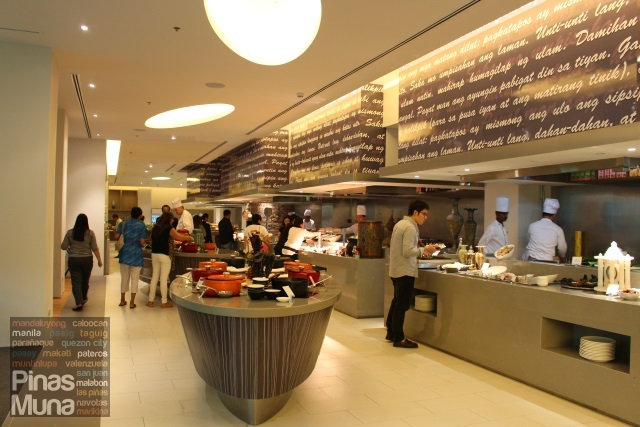 In addition, Food Exchange also offers daily lunch buffet and dinner buffet starting at P1,288 nett per person. They also have Sunday brunch at P1,588 net per person which includes free-flowing wines and cocktails. For the food selections and rates, check out our separate feature on Buffet a the Food Exchange, Novotel Manila Araneta Center. 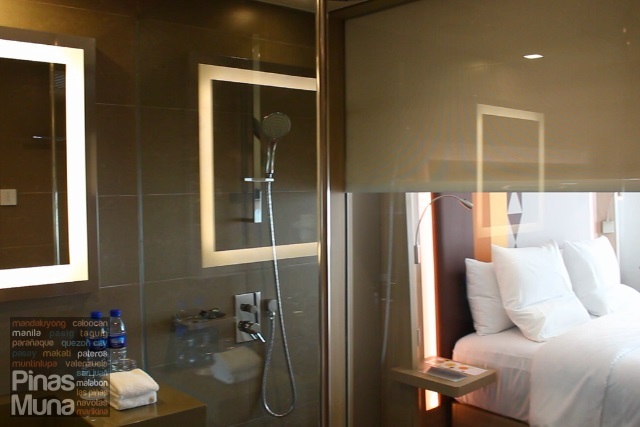 Below is a video summary of what to expect at Novotel Manila Araneta Center. Overall, we enjoyed every single day we spent at Novotel Manila Araneta Center. 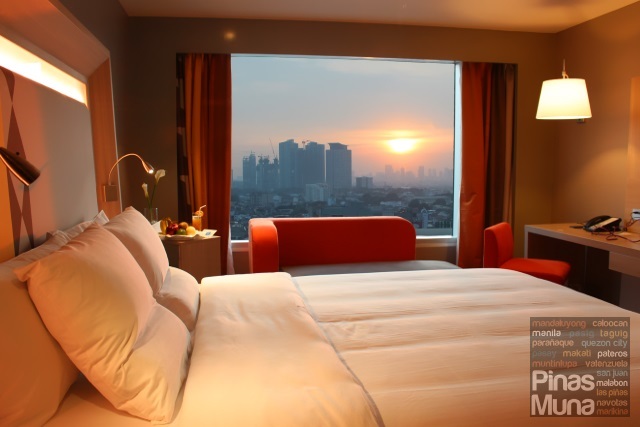 We love the youthful elegance of its design, the warm hospitality and outstanding customer service of the hotel's staff, the bed was totally amazing, and their buffet is one of our favorites in Metro Manila. 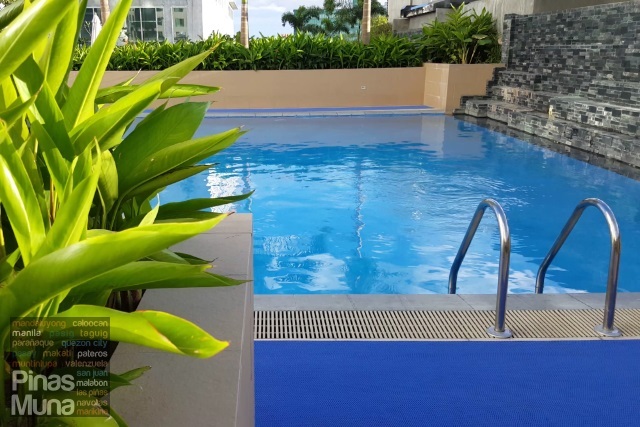 Having said all of these, we vote Novotel Manila Araneta Center as the best hotel in Quezon City both for staycationers and for business travelers, and as one of the Best Staycation Hotels in Metro Manila. Congratulations to the Araneta Group of Companies and to AccorHotels Group for successfully opening the very first Novotel hotel in the Philippines!